Dunstable Town fell to their first home league defeat of the season as they suffered back-to-back losses with a 3-1 reverse against Basingstoke at the weekend. 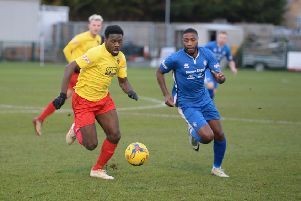 The visitors began strongly, with Nana Owusu’s pace and skill creating early opportunities, as Dunstable saw Shane Bush stretchered off with a head injury, replaced by David Keenleyside. Basingstoke went on to dominate and took a deserved and unsurprising lead after 16 minutes when Romane Rose connected with a through ball and fired through the legs of Dunstable keeper Jack Smith. Shortly after this Owusu again left the defence standing and was through on goal only to blast inexplicably wide, as Ashleigh Artwell’s shot from point blank range was well saved by Smith. The Blues’ best chances came from set-pieces, although they came out for the second period strongly, with Jhai Dhillon, Alex Cathline and Jack Hutchinson going close, and it was Hutchinson who made it 1-1, lobbing keeper Alex Tokarcyk for the equaliser on 48 minutes. However, parity was short lived, as two minutes later Dhillon was injured after a tangle with the keeper and needed to be replaced by Jordan Odofin. The game slipped into a scrappy phase where fluency was lost owing to several stoppages for free-kicks, but it sprang to life when Basingstoke scored their second and third goals. Man of the match Owusu outpaced the pedestrian Dunstable defence to score the second after 70 minutes and two minutes later in a replicate move, Richie Whittingham put the game beyond doubt for the visitors. Tokarcyk made a save at close range from Hutchinson, and this really was the only shot on target for the hosts in the second half as visiting sub Aaron Jarvis ought to have made it 4-1 as he drew Smith well out of his goal area, but the lob went narrowly wide. The result saw Dunstable drop to third in the table and they now travel to Barton Rovers in the League Challenge Cup on Tuesday night, before heading to Stratford Town in the league on Saturday. Dunstable: Jack Smith, Zack Reynolds, captain, Jhai Dhillon (Jordan Odofin 50), Danny Talbot, John Sonuga, David Longe-King, Jack Green (Kelvin Bossman 74), Danny Green, Alex Cathline, Shane Bush, (David Keenleyside 5), Jack Hutchinson. Subs not used: Jamie Head. Basingstoke: Alex Tokarcyk, Marcus Johnson-Schuster, Robert Atkinson, Nana Owusu, Joe Gater, Romane Rose (Aaron Jarvis), Ashleigh Artwell (George Hallahan), Richie Whittingham. Subs not used: Kieran Green, Michael Atkinson, Adam Francis.